This classic bread pudding is rich and silky-smooth, flavored with just the right amount of vanilla and spice. A silky Kentucky bourbon or whiskey sauce provides the wow factor, or replace the alcohol with apple juice. Not only is this bread pudding fast and easy; it's an impressive and comforting dessert. It's also an excellent option if there's no room in the oven. Because of their buttery flavor and soft texture, brioche bread or challah are excellent choices for bread pudding, but any good-quality bread will work just fine. Feel free to omit the pecans if you aren't a fan, or replace them with extra raisins or another kind of chopped nut. If the bread is fresh and somewhat moist, spread the cubes out on a large rimmed baking sheet. Put the pan in a preheated 325 F oven and lightly toast for about 10 to 12 minutes, or until dry. If your bread is already quite dry or stale, you may skip this step. Generously butter a 7-by-3-inch round baking pan or soufflé dish (2-quart). If you plan to remove the pudding from the pan for an attractive presentation, cut out a round of parchment paper and place it in the bottom of the greased baking pan. Grease the paper or spray it with nonstick cooking spray. Transfer the bread cubes to a large bowl; add the raisins and pecans, and toss to combine. Set aside. In a medium bowl, combine the half-and-half, 2/3 cup of sugar, the eggs and egg yolk, 1 teaspoon of vanilla, cinnamon, nutmeg, and salt. Add the melted butter and whisk until well blended. Pour the custard mixture over the bread cubes and stir gently until the bread cubes are well-coated. Spoon the bread mixture into the prepared baking pan. Pour 1 1/2 cups of water into the Instant Pot. Butter a 10 or 12-inch sheet of foil. Cover the pan of bread pudding tightly with the foil (buttered side-down). Place the pan in a baking sling or on the steaming rack. Carefully lower the pan and sling or rack into the pot. Lock the lid in place and ensure the steam vent is in the sealing position. Choose the manual setting (or pressure cook button), high pressure, and set the time for 42 minutes. When the time is up, let the pressure release naturally for 12 minutes. Carefully release the remaining pressure and remove the lid. 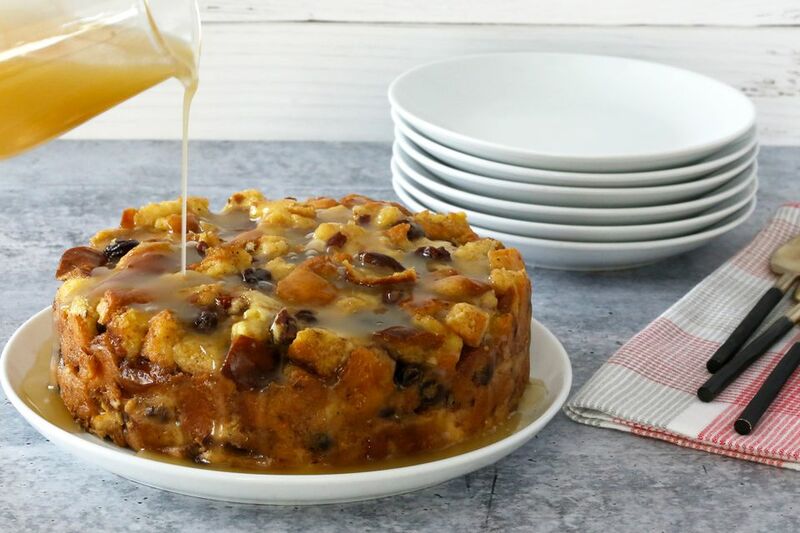 Remove the bread pudding to a rack. Let the pudding stand for about 5 minutes. Remove the foil. Set the bread pudding aside to cool slightly while you prepare the sauce. Melt the 6 tablespoons of butter in a saucepan over medium-low heat. Add 2/3 cup of granulated sugar, the heavy cream, and the bourbon (or juice). Bring the mixture to a boil; reduce the heat to low, and simmer uncovered for about 3 to 4 minutes. Stir 1/2 teaspoon of vanilla into the sauce and set it aside to cool slightly. The sauce will thicken more as it cools. If desired, when the bread pudding is cool enough to handle, run a knife around the side of the pan and carefully remove it to a serving plate. Alternatively, spoon the warm pudding into bowls. Pour the warm sauce into a small pitcher or cup and serve it with the bread pudding.